The Respected Mission Board – Church of the Lutheran Confession – U.S.A.
Greetings in the precious name of our Lord Jesus Christ. May He be pleased to make us instruments for the recovery and return of God’s glory, in His House. Dear brothers, we regret to write you about recent floods, which occurred in the month of September 2009. 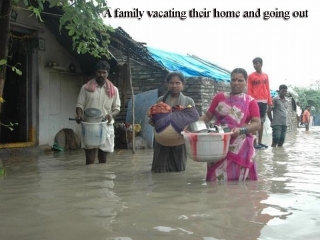 The four days of torrential rains and flash floods have killed nearly 200 people in the districts of Guntur, Mahaboobnagar, Krishna and Kurnool and left tens of thousands of people homeless. The rains and floods destroyed thousands of homes. Flooding has also destroyed crops, washed away roads and disrupted communication links. We regret to inform you that Rev. G.Anandarao, our CLCI Pastor from Seethanagaram congregation has died accidentally due to the flood effect. Also it is with deep regret to inform you that two of our members from Repalle area CLCI congregations have died due to these heavy floods. The train and bus services were affected in these above districts due to the heavy floods. Many trains and busses were cancelled, due to the flood affected railway tracks and roads. The transportation facilities were totally disrupted to the above districts except few auto rickshaws and bicycles. We regret to inform you that seven of our congregations and twenty preaching stations in Krishna district and five of our congregations and 16 preaching stations in Guntur district were severely affected by the flood devastation. 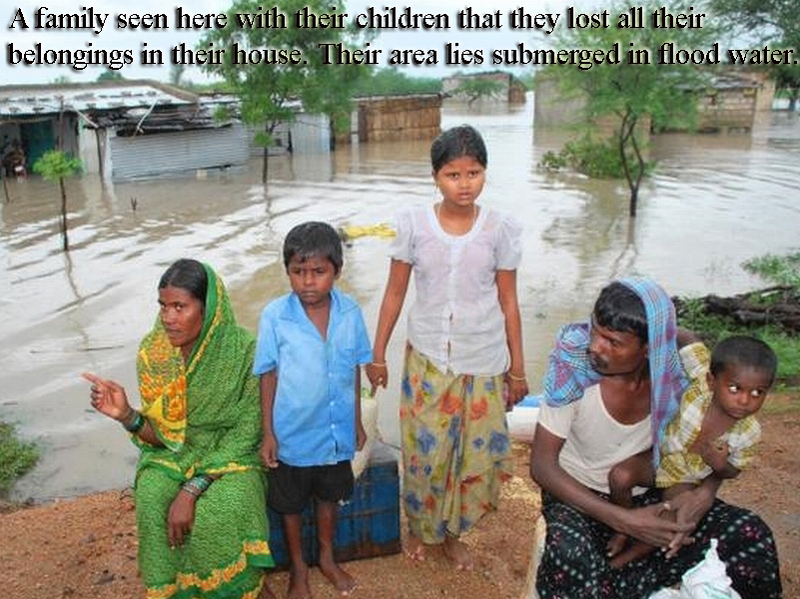 These floods left behind a deluge of much tragedy and suffering in these affected congregations. Especially the members from Krishna district have lost mostly to the floods not even dry clothes or anything. Heavy flood swamped their houses, paddy fields, damaged the crop, besides washing away road links to the village. Many members have told us their experiences. Main crops like rice, commercial crops like chilies, tobacco, turmeric and other vegetable crops were damaged. Just a few weeks before the Kharif harvest that is in the month of December, hundreds of hectares of crop in the Guntur, Krishna districts, mostly paddy, have been ruined by the floods. Our members the above congregations have given everything into our Lord’s hands. We have been visiting the affected CLCI congregations and preaching stations, one after another to review the situation. It took many days to visit the congregations because of the bad condition of the roads. Attached photos describe the flood damages. The scenario is grim and heart rending. Hundreds of tanks, rivulets, canals and drains have been over flowing and have been breaching and getting severe damage to the houses. Even drinking water has become a serious problem. Moreover many people have been suffering from various deceases because of the polluted water seeped all over. Many thatched mud walled huts were fully collapsed. Flattened paddy fields are a common sight. Still many paddy fields are in the flooded water. The cost of rice, especially vegetables and kerosene went up. The prices have increased about 50 to 70 percent. The wholesale businessmen attributed the reason of the price rise because of the shortage of transport in the above districts. In the districts of Guntur and Krishna more than 1.8 million people have been affected by the floods and more than 100,000 people were homeless and television pictures showed hundreds of people waving their hands from rooftops for help. Some were seen clinging on to tree branches. Without food and water for the last three days, hundreds of people remained trapped in flood waters. We regret to inform you that many of our CLCI members have lost their belongings, paddy and have been suffering from partially and fully damaged houses due to heavy floods. We have made some immediate efforts to set up relief measures. Over 30 bags (30 X 100 kgs = 3000kgs) of Rice, have been dispatched to the flooded CLCI congregations. Also we are trying to provide some household goods vessels like plates, tumblers and sleeping mats, towels, blankets, medicines and emergency used clothing. We request the respected members of the CLC to extend a helping hand in this hour of emergency. We are humbly requesting and urging all the respected CLC members to extend liberal assistance to mitigate the hardships being faced by our flood affected members of the CLCI, who are battered by the flash floods. Also we are humbly requesting the respected MCH, that it has become urgently necessary for the CLCI to ask your help regarding ‘used cloths’. We request the respected MCH to donate some used clothing material like shirts, pants, especially blankets, bed sheets towels etc. It would be very kind of respected MCH if you could take immediate action in sending the clothing to these poor members. Please help us. I will be in contact with you through e-mail.